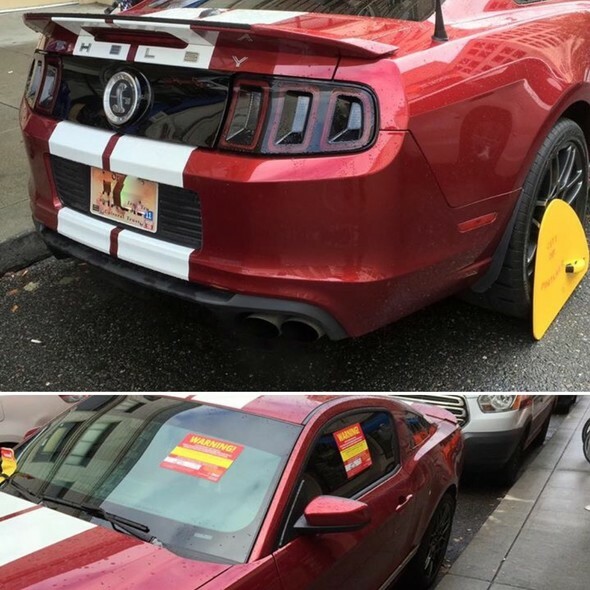 (Sept. 27, 2016) The Portland Bureau of Transportation's parking enforcement program has applied parking boots to 21 vehicles that had overdue parking citations totaling $82,795 in less than three weeks, the bureau announced today. PBOT started using parking boots on Sept. 7. 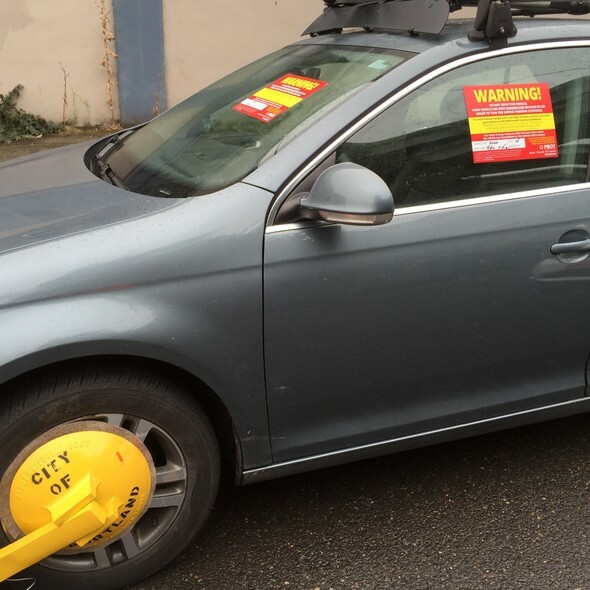 As of Monday, Sept. 26, enforcement officers had booted 21 vehicles, of which 10 were released to the owner by the Multnomah County Circuit Court, nine were towed for lack of payment and two were still remaining on the street with the parking boot applied. 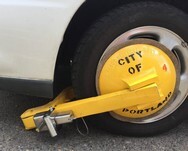 In August, the Portland City Council approved a new policy allowing PBOT parking enforcement to use parking boots. 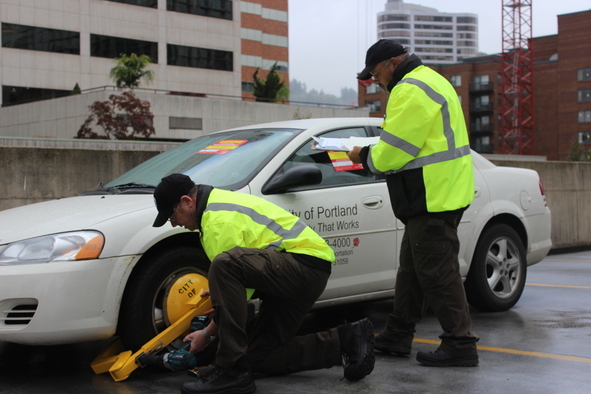 PBOT uses boots to immobilize a vehicle for up to 36 hours, allowing the owner time to settle outstanding citations with the court. This approach allows people to pay their tickets, and avoid towing fees. 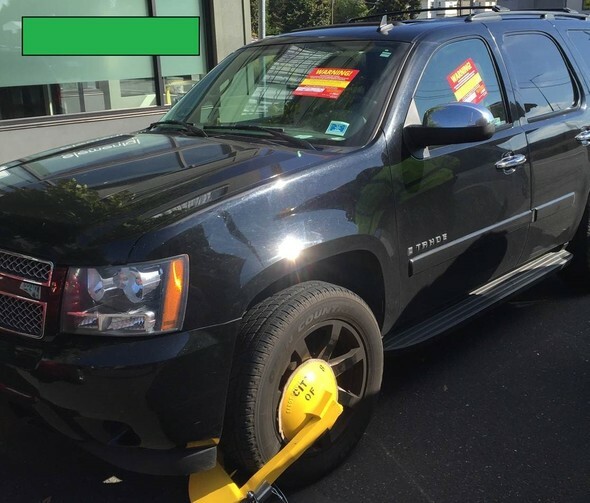 After booting, the vehicle is towed if the vehicle owner has still not settled with the court for outstanding citations, and normal fees apply. "Everyone needs to pay their parking tickets,” said Commissioner Steve Novick, who oversees PBOT. “I wanted PBOT to start booting largely because the towing and vehicle storage fees are an unnecessary penalty that is particularly burdensome for people with low incomes. In recent weeks, we've heard that people are going to court and settling up their outstanding tickets and that's great. Our parking enforcement program helps make sure everyone is following the rules of the road." Vehicle owners who have questions about outstanding parking citations can call 503-988-3235, option 2 or see the court's web site on parking citations. 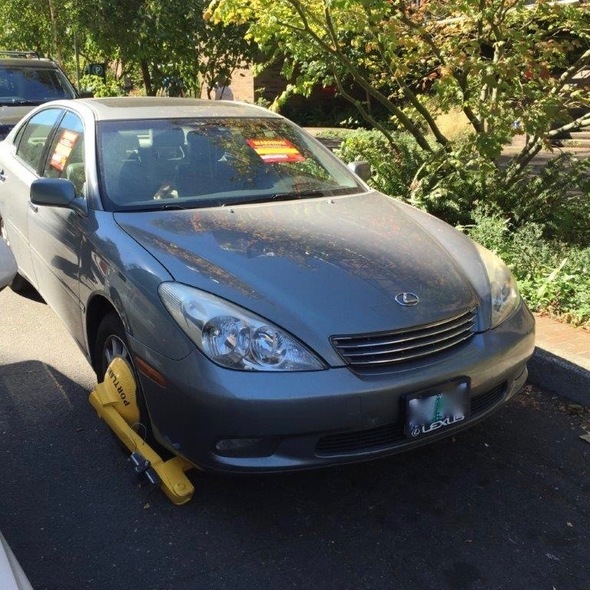 Booting gives vehicle owners the opportunity to pay their citations or appear in front of a judge at Multnomah County Court to resolve their outstanding citations, before they start getting hit with additional towing charges. PBOT's parking enforcement operation is a crucial part of the city's management of public space, said Transportation Director Leah Treat. "Parking spaces are an important part of the public space that PBOT manages for Portlanders," Treat said. "Our parking rules are essential to manage public space in the public interest. We issue citations to make sure everyone is following the rules. Enforcement helps our parking system provide Portlanders with the access to homes and businesses that we all enjoy every day." For more information, see Frequently Asked Questions about PBOT's booting program. PBOT Parking Enforcement staff demonstrate booting a vehicle. Photo by Hannah Schafer, Portland Bureau of Transportation. Photo by Portland Bureau of Transportation.